You’ve seen the immaculately organized closets featured on blogs and Pinterest pages and in design magazines. But how can you get the same look in your own home? Most of those closets tend to have either tons of spare space or an expensive, custom closet organization system (or both), making the look seem even more unattainable. Fortunately, there are some cheap and easy closet hacks you can use to get the organized closet of your dreams. Check out these quick tips for sprucing up your closet for spring cleaning. This may be your easiest solution to start with. Few people realize how much bigger their closet will seem without a door attached. Even if the door opens out from your closet space, it still makes the area seem more squeezed in. Take that door off and put it in storage, then either leave your closet open or hang up a cool curtain that can be easily pushed aside. This costs little to nothing and instantly gives you a whole new outlook on your closet space. Before you really get started putting things in place, you’ll want to pare down your collection of clothes and accessories. You’ll be amazed at how many things you haven’t worn in months or even years once you really start digging. Once you’ve purged the old stuff you’re no longer wearing, place out-of-season items away in bins in the back of the closet, under the bed or another out of the way place. This minimizes how many things are out or hanging at once. Then, follow this important rule: don’t buy anything new unless you’re willing to give something from your closet away! For those who have trouble letting go of clothing, try this handy trick. Place all your hangers with the hook facing out towards you. When you wear an item, turn it back so it’s facing in. Any items that are left on hangers facing out after a year must go. There are tons of hangers you can use to instantly organize certain clothing items while also taking up less space. 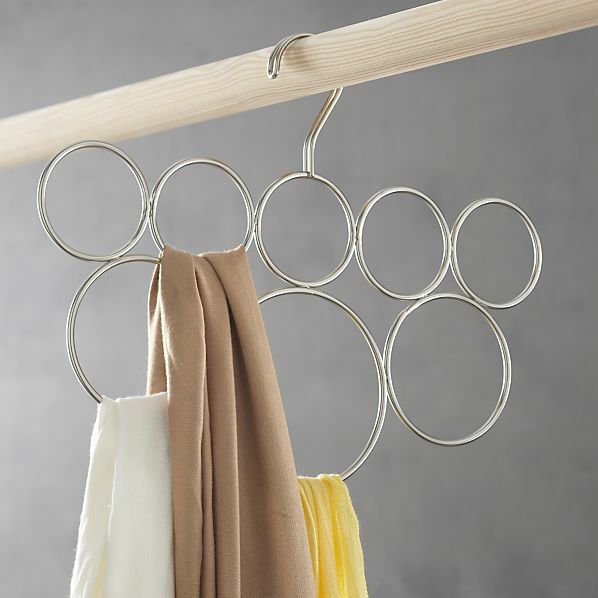 Scarf hangers are easy to find and one of the best multi-purpose items for your closet. You can also hang ties, belts or even tank tops on an inexpensive tie hanger. Pants hangers with multiple bars allow you to save space as well. And don’t forget about those tiered shelves which stack your shoes for efficient storage. Many of these items are common finds at garage sales and thrift stores, so check there before you buy new. Every space inch of your closet should be use efficiently for the best closet organization. That doesn’t necessarily mean every inch will be filled, but utilizing a previously overlooked nook can suddenly open up space elsewhere. 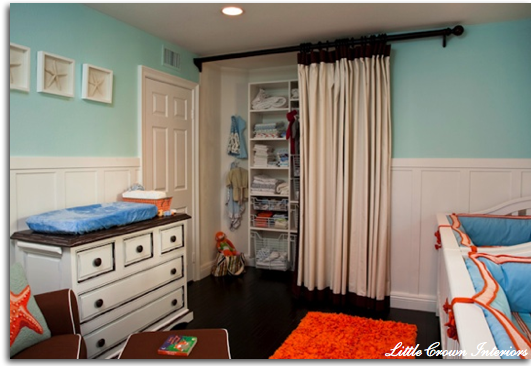 A great way to do this is to use inexpensive hooks in those odd or tight spaces. Rather than hanging a jacket or stacking hats on a shelf, you can hang them on the wall. Hooks also offer a great way to store jewelry, purses and other accessories on wall space that would otherwise go unused. Organizing your clothing and accessories by color is a great way to find just what you need. You can arrange things from light to dark, like the rainbow or by solids and prints. Another way to categorize is by style, like long sleeve to short sleeve to sleeveless. You can also separate by work clothes, casual clothes and special occasion clothes. Find the system that works best for you then stick with it. In addition to making your closet more accessible, it also helps you keep track of your items and what you’re actually wearing so that it’s easier to get rid of things that aren’t in rotation anymore. The closet area above the bar where you hang your clothes is often overlooked. If you don’t have any shelves up there, it’s time to get some. It can be super easy to install your own with some wooden planks, a drill and the right supports. Just ask your local hardware store for tips and tell them you’re looking to save money. Since it’s inside your closet, you don’t need fancy finished shelves, so they may even be able to give you unused scrap wood from previous projects. Once you have shelving in place, make the most of it by using the closest shelf for folded items like sweaters and T-shirts. Shelf dividers can be found on the cheap and make it much easier to keep these areas organized as you take out and put away various items. Then use upper shelves for things you don’t use often, like suitcases or spare blankets. With these tips, it’s easy to create an organized closet that looks like something out of a magazine. Best of all, you’ll be able to get to your clothes and accessories more easily so you can actually enjoy all the items you own.